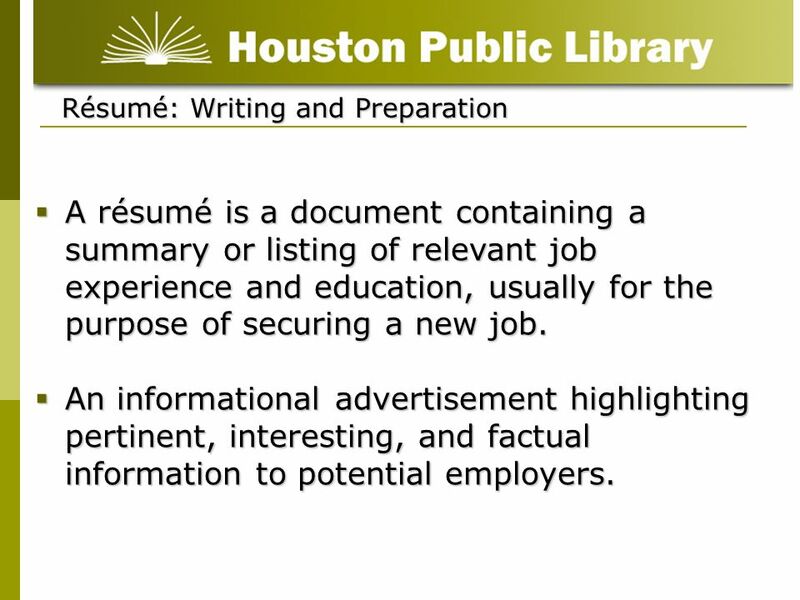 A résumé is a document containing a summary or listing of relevant job experience and education, usually for the purpose of securing a new job. An informational advertisement highlighting pertinent, interesting, and factual information to potential employers. Résumé: Purpose To obtain an interview To obtain employer interest To advertise, persuade, and demonstrate key abilities, skills, assets and experiences relative to your chosen career. 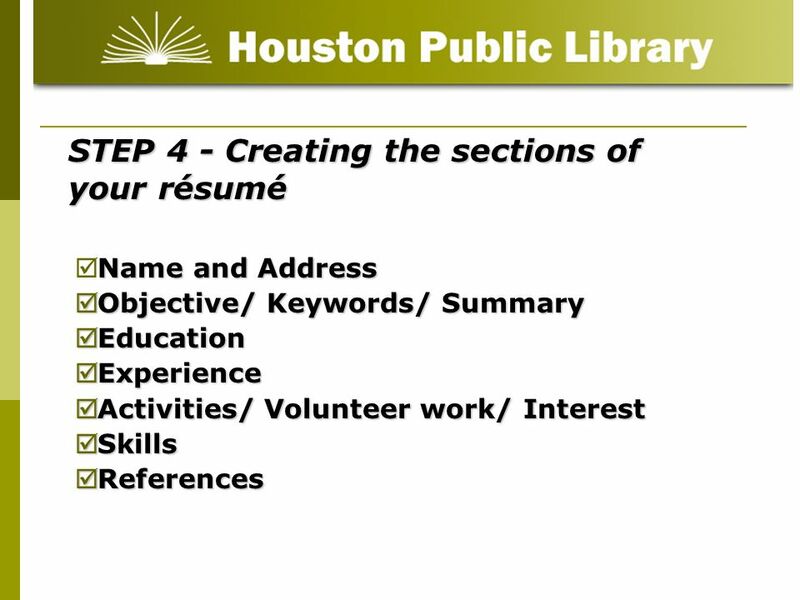 4 Résumé : Overview Summary of your experiences and skills relevant to the field of work you are entering. Highlight your accomplishments to show a potential employer that you are qualified for the work you want. It is NOT a biography of everything you have done. You should include extracurricular, volunteer and leadership experiences. 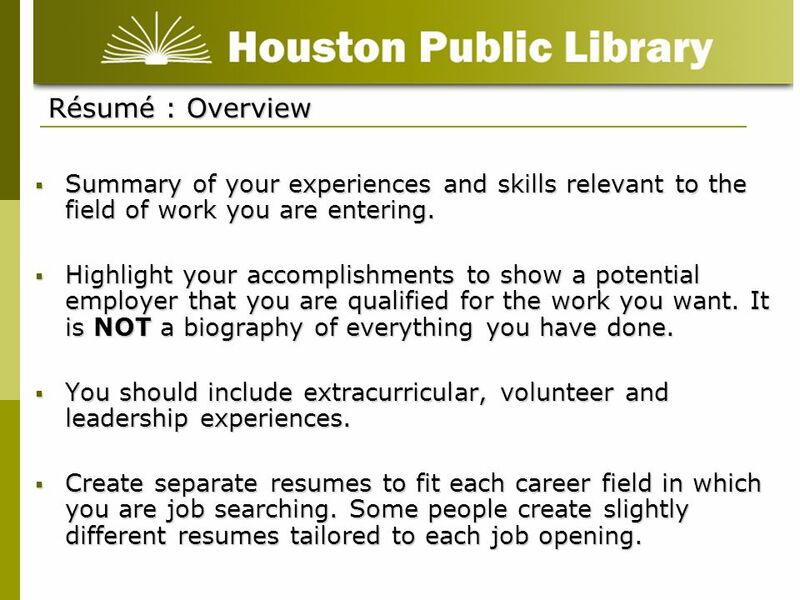 Create separate resumes to fit each career field in which you are job searching. Some people create slightly different resumes tailored to each job opening. You should list paid work, volunteer positions, extracurricular activities (especially those in which you had a leadership role) and internships. You should go as far back as four or five years. Even graduating seniors will often have one or, occasionally, two items from high school on their résumé. 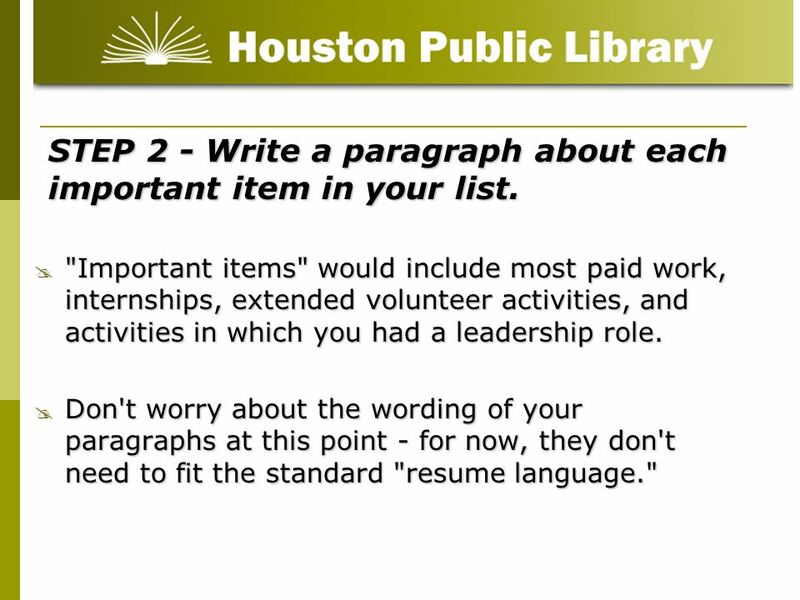 6 STEP 2 - Write a paragraph about each important item in your list. 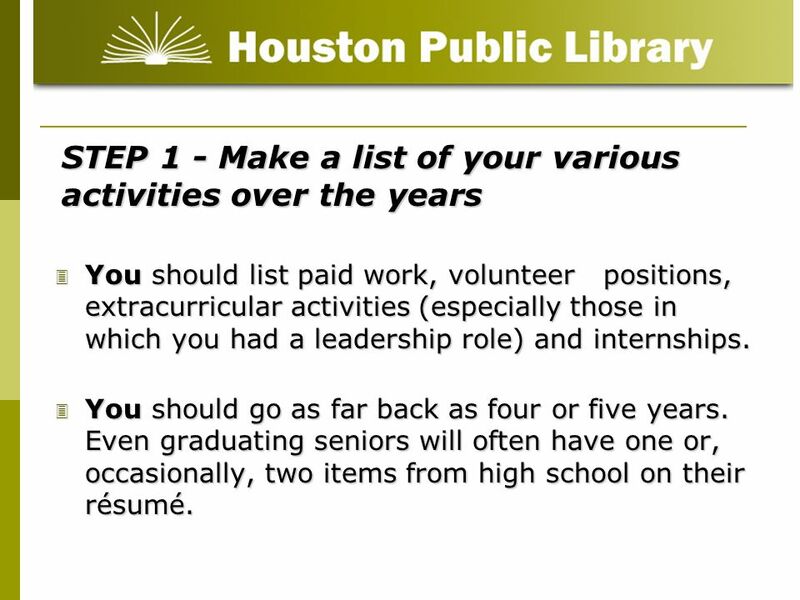 "Important items" would include most paid work, internships, extended volunteer activities, and activities in which you had a leadership role. Don't worry about the wording of your paragraphs at this point - for now, they don't need to fit the standard "resume language." What are your greatest strengths and how can you demonstrate those strengths through your experience. What are the requirements and needs of this particular industry, this particular employer and this particular job? Your task, then, would be to demonstrate those qualities through the activities described on your résumé. NOTE: You may want to create somewhat different résumés for different jobs. 9 Include your e-mail address. Name and Address Put your name in at least 14-point (font size). Recruiters often must look through stacks of résumés in search of a particular one. Make it easy for them to see your name. Include your address. 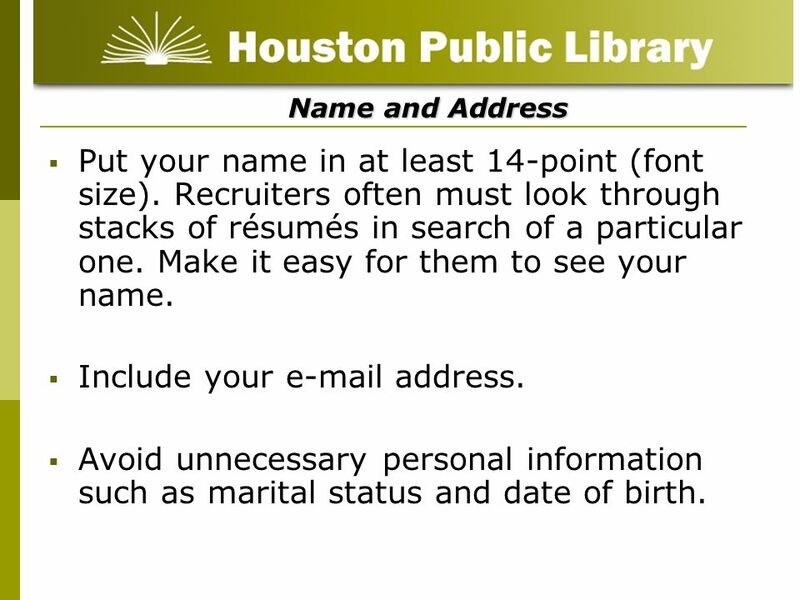 Avoid unnecessary personal information such as marital status and date of birth. Focus on what you have to offer rather than on what the job can offer you. This may sound backwards, but employers are not so much interested in what you hope to get out of a job with them, so much as they want to know whether you fit their needs. 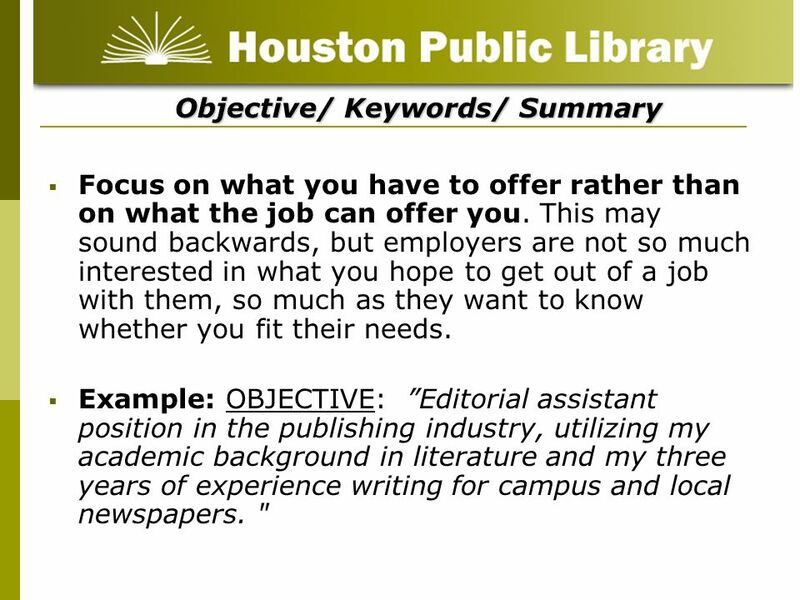 Example: OBJECTIVE: ”Editorial assistant position in the publishing industry, utilizing my academic background in literature and my three years of experience writing for campus and local newspapers. " 11 Education This section always goes first on your résumé, as long as you are in school. 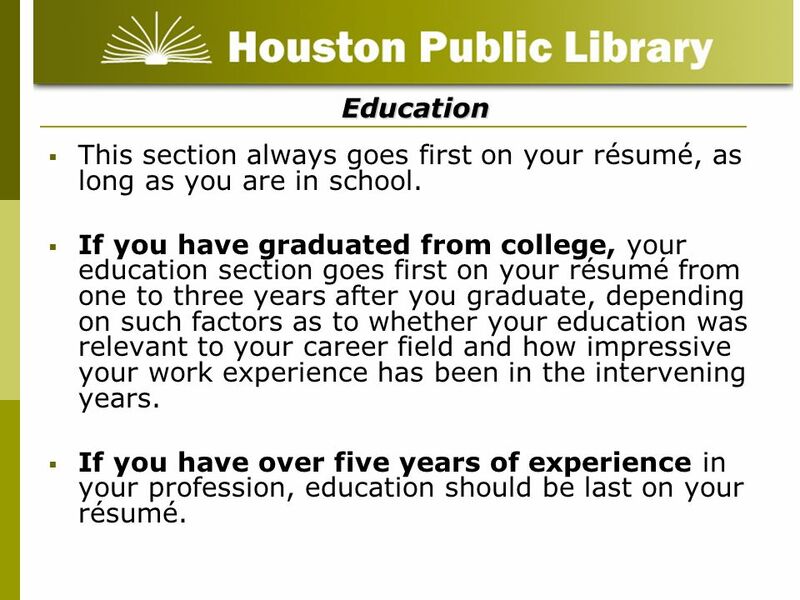 If you have graduated from college, your education section goes first on your résumé from one to three years after you graduate, depending on such factors as to whether your education was relevant to your career field and how impressive your work experience has been in the intervening years. If you have over five years of experience in your profession, education should be last on your résumé. 12 Experience Don't feel that you must limit this section to paid work experiences, especially if you are still in college or a recent graduate. Employers understand that the most valuable or most challenging experiences often occur in internships, volunteer work or other extracurricular activities. Nursing Clinical Experience - List placements in reverse chronological order, including dates. Describe type of setting, responsibilities, and knowledge gained. Student Teaching Experience - Include name and location of placements, dates involved, and grade level of assignment. Major responsibilities in teaching area should be emphasized. 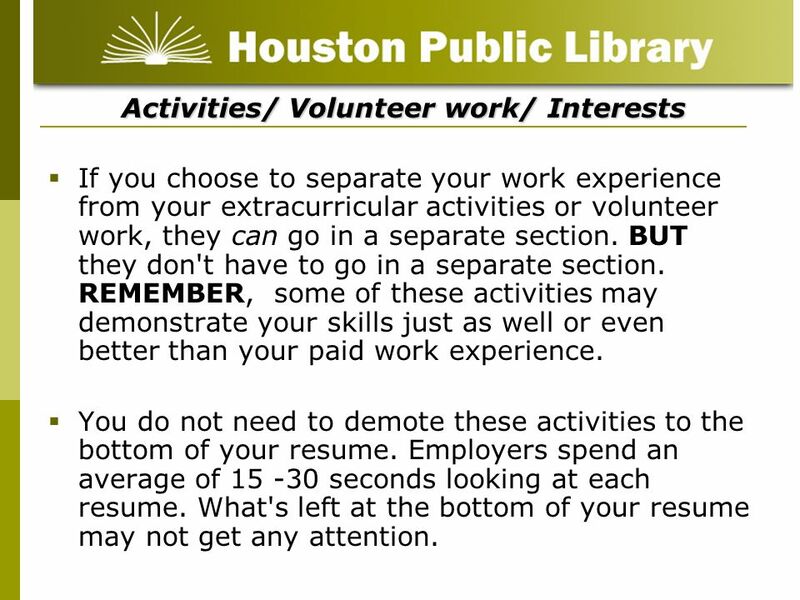 If you choose to separate your work experience from your extracurricular activities or volunteer work, they can go in a separate section. BUT they don't have to go in a separate section. REMEMBER, some of these activities may demonstrate your skills just as well or even better than your paid work experience. You do not need to demote these activities to the bottom of your resume. Employers spend an average of seconds looking at each resume. What's left at the bottom of your resume may not get any attention. 14 If you know programming languages, list those as well. 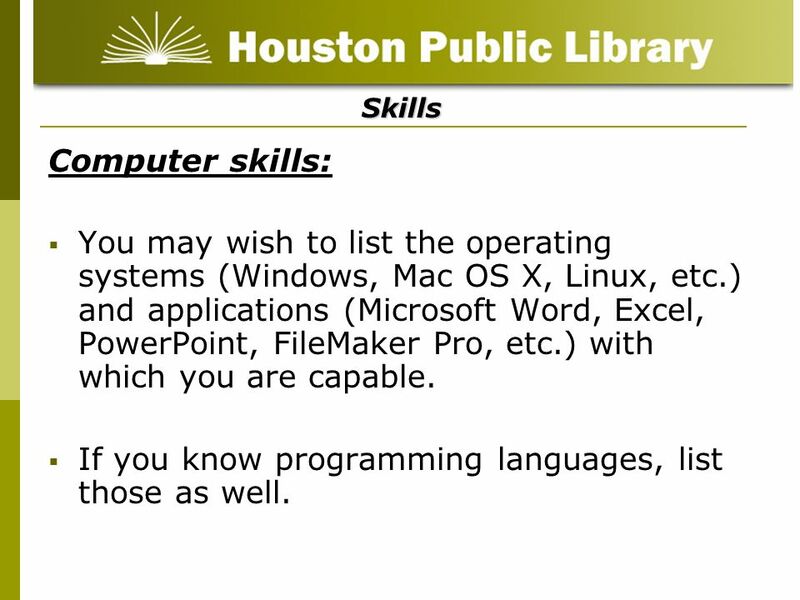 Skills Computer skills: You may wish to list the operating systems (Windows, Mac OS X, Linux, etc.) 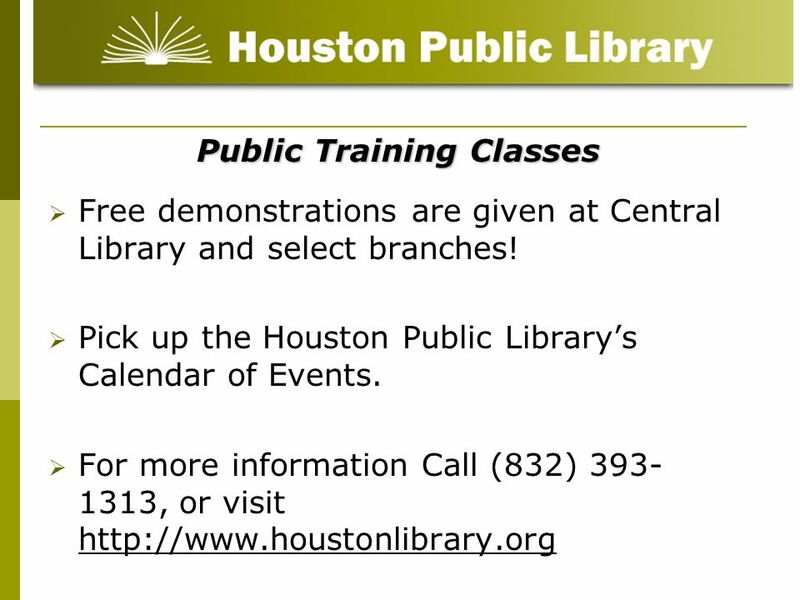 and applications (Microsoft Word, Excel, PowerPoint, FileMaker Pro, etc.) with which you are capable. If you know programming languages, list those as well. 15 References Don't write "References Available On Request" on your résumé. This went out of style over a decade ago. 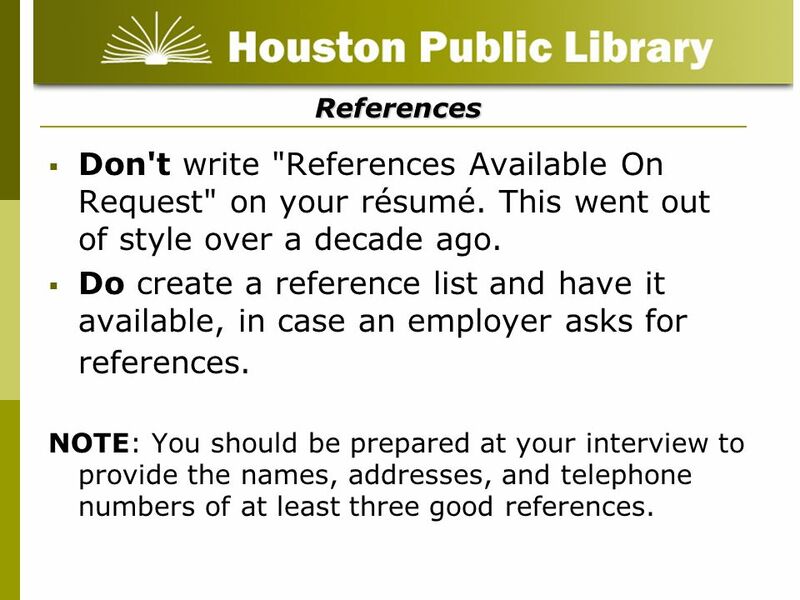 Do create a reference list and have it available, in case an employer asks for references. NOTE: You should be prepared at your interview to provide the names, addresses, and telephone numbers of at least three good references. Leave plenty of white space on your résumé - don't make your résumé look crowded. Emphasize job titles by boldfacing them (except where the name of a prestigious organization you have worked for will grab their attention first). Place the most important information closer to the top of your résumé. (For example, if you are a student and your paid work has been day-to-day, but you have great computer skills or excellent extracurricular leadership experience, then put the skills or the extracurricular near the top of your résumé.) 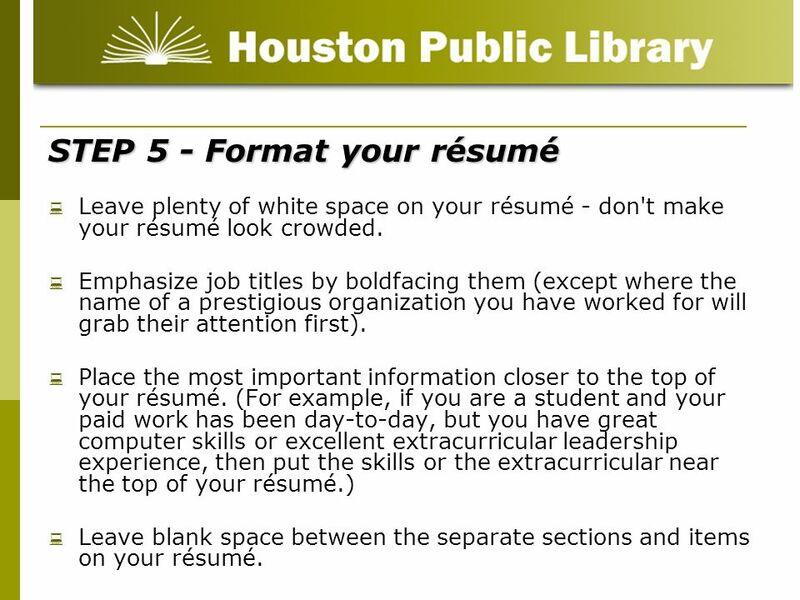 Leave blank space between the separate sections and items on your résumé. Condense to one page. 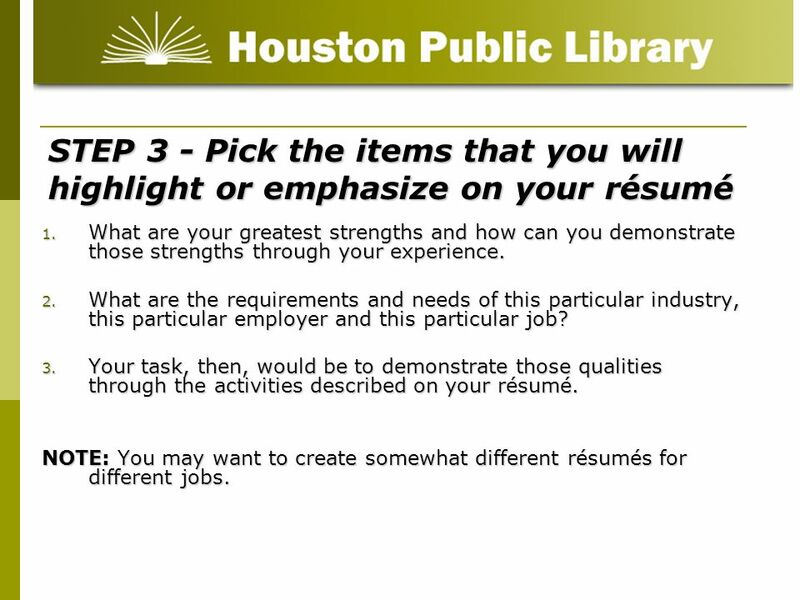 Center and balance your resume on the page, leaving approximately 1 inch margins. 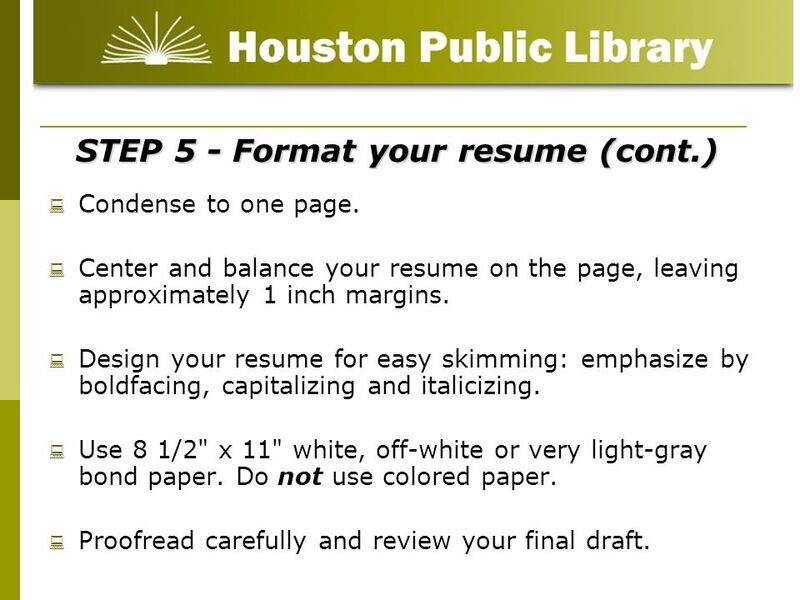 Design your resume for easy skimming: emphasize by boldfacing, capitalizing and italicizing. Use 8 1/2" x 11" white, off-white or very light-gray bond paper. Do not use colored paper. Proofread carefully and review your final draft. 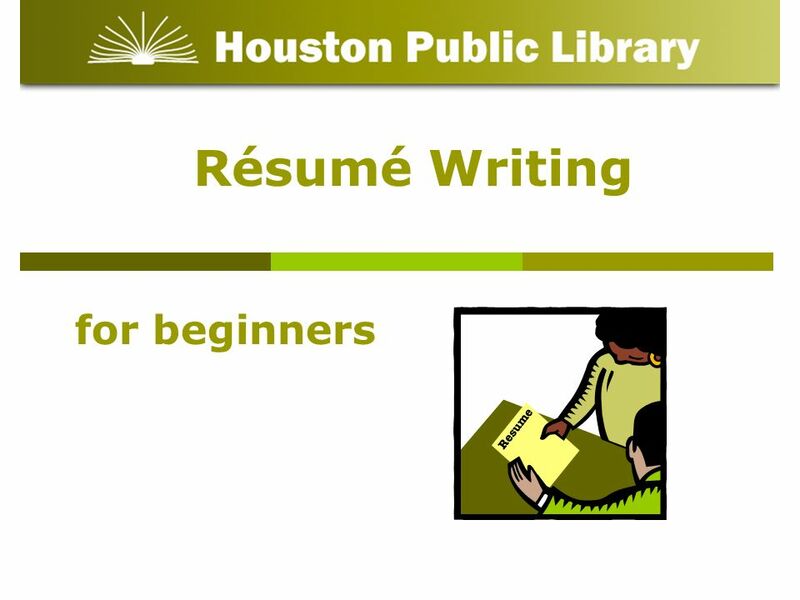 Download ppt "Résumé Writing for beginners." Building A Resume Revised April Your Resume is Your Marketing Tool Resumes may be prepared in various forms. Remember to show your strengths Resumes. Developing A Resume Take Charge of your Finances. Résumé Writing The main reason for a résumé is to promote your qualifications, to get the employer interested enough to offer you an interview. Writing an Effective Resume Writing Consultant Presentation EG 1003: Intro to Engineering and Design Polytechnic Institute of NYU. 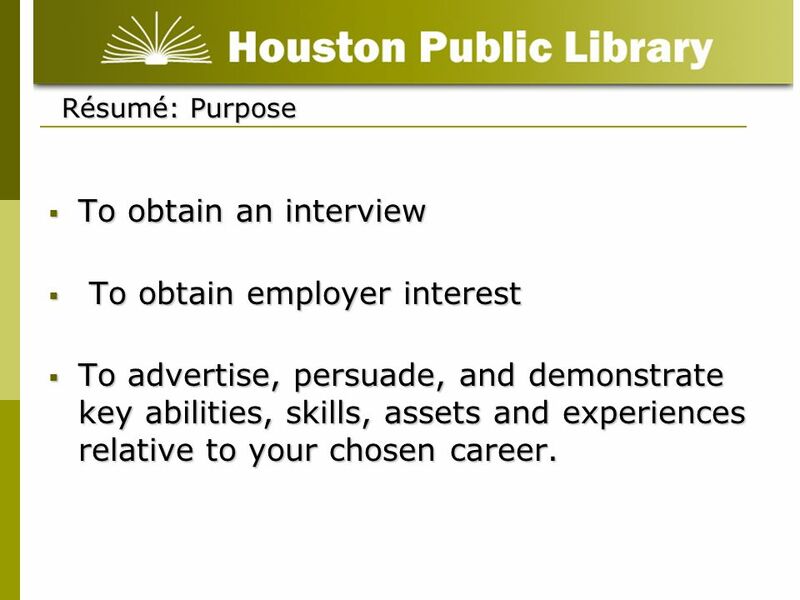 Writing an Effective Resume and Cover Letter Career and Professional Planning. Kevin Allan, MS, LPC, NCC Director of Career Services University of Mary.  A resume is a summary of your experiences and skills relevant to the field of work you are entering.  It highlights your accomplishments to show a. In essence, WHY you are applying for the job!.  They are an essential part of your resume package that you give to a potential employer  This is you. What it is and what it is used for?.  It is a type of writing by an author who is trying to get something. As a result, it is an extremely persuasive. Resume Writing You are what you write! Writing an Effective Resume Clinton High School 401 Arrow Drive Clinton, MS 39056.